A museum in London has re-created the bedroom where the rock legend crashed in the late '60s. Jimi Hendrix in his home. Heading to London anytime soon? You might want to schedule a visit to Jimi Hendrix’s former home. You can actually step inside the third floor flat and see how the music icon lived. 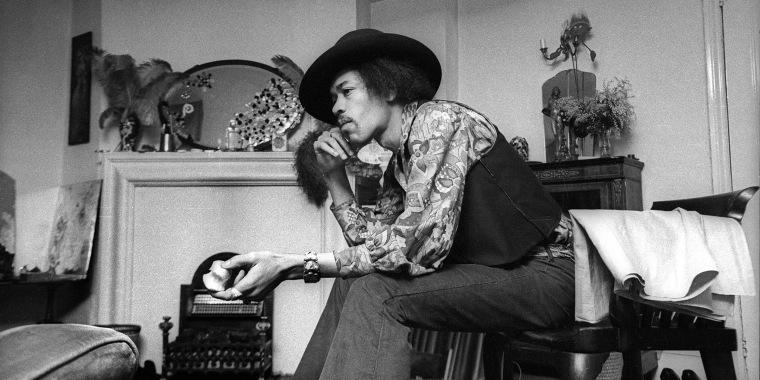 Handel & Hendrix in London, a museum that includes the apartment the musician resided in from 1968 to 1969, has re-created Hendrix's bedroom based on photographs and recollections from visitors and his then girlfriend Kathy Etchingham. And it’s exactly how we imagined it: cool, colorful and '60s chic. With Persian rugs scattered across the floor, the room features a bed with a pink and orange bedspread, hand-drawn and woven to match the original. Next to it sits a dark wooden captain's chair with cabriolet legs that is a reproduction of one that Hendrix was photographed in during a 1969 photoshoot. Visitors can sit in it and take their own pictures. The room is full of detailed decor like a replica batik wall hanging, original oval mirror and bright turquoise curtains. And of course a guitar sits casually on the bed. It’s a copy of the acoustic one Hendrix used. Located at 23 Brook Street, the apartment is also part of the museum that includes exhibits on composer George Frideric Handel, who lived next door at 25 Brook Street — 240 years before Hendrix was there. You can find out more information about visiting Hendrix’s home at handelhendrix.org.